The Anthropologists is a company "dedicated to the collaborative creation of investigative theatre that inspires action"
Michael Ables, Jean Goto, Brian Demar Jones, and Mariah Freda in No Man's Land. Photo by Victoria Medina Photography. BOTTOM LINE: No Man's Land is a sensitive investigation of the internal politics of storytelling in the theatre. "#Woke" theatre artists like the ones portrayed in No Man's Land encounter the politics of their chosen stories every day in a plethora of aesthetic choices: whose perspective should the story be from? In what place? Where should the performance be staged? Should the story be factual and true-to-life where possible, or embellished? Who should be cast? Some artists give up, saying "I just cast the best person for the role," or "I just like the way it looks" when they aren't interested in engaging with these questions. It's a controversy within the art world whether they need to, and a bit of a generational divide: does good art need good politics? Thankfully, No Man's Land has both: it manages what much devised theatre does not, carrying out a thoughtful and entertaining full-throttle investigation of a single story based on real-life events. The story is this: in 2014, white American mining executive Jeremiah Heaton places a flag on some seemingly-unclaimed territory in Africa, and declares himself king of the newly-formed North Sudan. He receives donations and accolades based on his fatherly love for his daughter, who just wanted to be a princess. The actor-characters in the devised piece, Georgia, Tony, Reggie, and Annie, tell this story over and over again from many angles, conversing heatedly about the political implications of each method. From interpretive dance to movement-based ensemble storytelling, to a self-styled "Minstrel show," to a campy and aggressively pink YouTube spoof section (a big shoutout to Lux Haac and Sarah Edkins for this scene), performers Michael Ables, Jean Goto, Brian Demar Jones, and Mariah Freda dutifully try to crack the nut of how to represent a single story without passing along its implicit race and gender politics. The team has done a fine job of showing the deep personal importance of these issues while expanding their thoughts to include a wider range of perspectives. Most importantly, it does this without bring preachy, or dragging the audience to the psychologist's couch. It is simply the story of several earnest people trying their best to tell a story in a way that makes the world safer and more open to people like them. It's uplifting but realistic, courageous but honest. Perhaps it's exactly what theatremakers need to see right now. No Man's Land is by The Anthropologists. Directed by Melissa Moschitto. 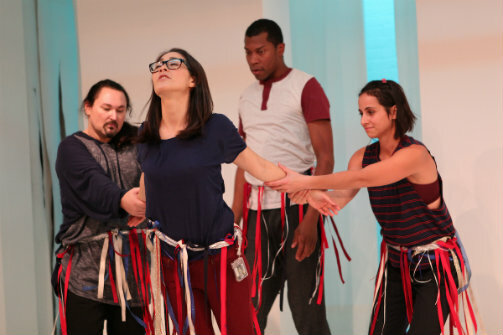 Dramaturgy by Lynde Rosario. Scenic Designer is Sarah Edkins. Costume Designer is Lux Haac. Lighting/Projection Design by Nic Christopher. Sound Design by Christopher Gillard and Justin Stasiw. Production Stage Manager is Allison Newcombe. Assistant Stage Manager is Mary Daniel. Assistant Scenic Designer is Tasha Sandage. Artistic and Programming Intern is Sarah Pyatt. Assistant Director/Producer is Alex Randrup. Press Representative Emily Owens. Producer is Malini Singh McDonald. The cast is Brian Demar Jones, Michael Ables, Jean Goto, and Mariah Freda.